The Costa Rica News (TCRN) – The commercial sector of organic agriculture in Costa Rica has its eyes fixed to the growth that is taking place the French market, because this niche is one of the top in terms of trade in the European Union. And the demand for organic agriculture shows steady growth in France, but its domestic supply risks faltering in the coming years in a market which imports about 35% of the references “bio” (organic). According to the Foreign Trade of Costa Rica (Procomer) in the latest tally released by the Bio Agency, the consumption of organic products in France grew by 9% and achieves a turnover of 4,380 million euros today (compared to 2,100 million in 2007). The daily Les Echos also published in the middle of last month that organic products now represent 2.5% of the French food market, seven years ago the figure was 1.3%. The sector is growing especially in regards to fresh products, which account for more than half of their sales, within this category eggs and milk top the list (11% of total). 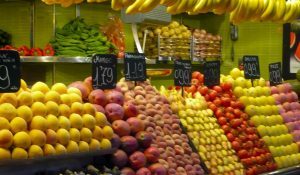 In addition, about 6% of the fruits and vegetables consumed in the market today (excluding citrus and bananas) are organic. Wine, whose sales have increased 56% between 2010 and 2013, is the fastest growing reference, followed by food products and drinks (36%), and prepared and frozen (34%) dishes. Organic products are present in all distribution formats, but its sales have grown more in specialized direct selling establishments (17.2%) than in large food surfaces (6.5%). On the supply side, the results are more moderate. Although certified crops have increased by 9% in 2013 and represent 4% of the agricultural land, land in conversion decreased (between 20% and 40% depending on the crop). Moreover, although the number of organic farmers has grown by 4% pace has slowed. According to statistical records of Procomer Costa Rican agricultural exports reached in 2013 $2,447 million and were mainly directed to the regions of North America and the European Union with shipments that exceeded $1,193 and $ 1,024 million respectively, which demonstrates the importance of the European market for the national export sector. Read the full story via Costa Rica Promotes Increased Sales of Organic Products in France | The Costa Rica News.